There are many DIY Lego projects on the internet, but it’d be hard to think of one cooler or more useful than 19-year old David Aguilar’s. The bioengineering student has spent years been building and evolving a series of Lego-based prosthetic arms. He’s currently on his fourth evolution. 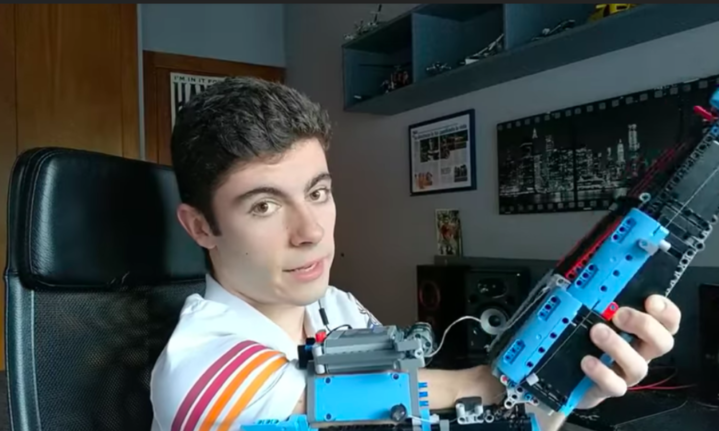 Calling himself HandSolo on YouTube, Aguilar has been building artificial limbs for himself since he was nine years old, according to a report in Reuters. “As a child I was very nervous to be in front of other guys, because I was different, but that didn’t stop me believing in my dreams,” he tells the news agency. Now a student at Universitat Internacional de Catalunya in Spain, the Andorran national doesn’t need to rely on artificial limbs all the time. But as his YouTube channel shows, when he needs one, he wants it to be as custom-built as possible. While there are pictures of Han Solo in the background of many of his videos, Aguilar pays tribute to another famous sci-fi renegade: Tony Stark, the billionaire inventor from Marvel comics and Avengers movies. Stark names his Iron Man suits Mark-1, Mark-2, and Aguilar has followed suit. His LEGO arms are named MK-I, MK-II, MK-III, etc., in tribute. The MK-I was built just a year ago, when Aguilar was 18. Since then he’s gone through various Lego sets, including jets and construction vehicles, reconstructing them into battery-operated arms. His end goal with the project ties in nicely with his aims in life: building affordable prosthetics for people who need them. Currently, studies estimate that the price of a new prosthetic leg can cost between $5,000 and $50,000, not counting the upkeep. Anyone working to bring down the costs would surely find interested buyers.